"My baby! What have you done to my baby?!" The above info came from Matt Wilkerson, and was edited by yours truly (contact me). The image came from Pojo's Dragonball. 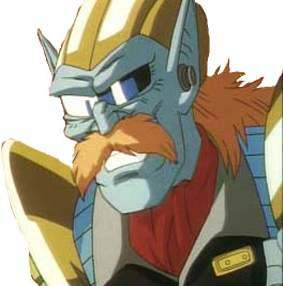 Dr. Myuu is a mad scientist who tried to gather the dragon balls. He would use them to complete his creation, Baby, and use it to take over the universe. However, Goku, Pan, and Trunks foiled his plans. Myuu escaped, but was killed when Baby burst out of his body. It was revealed then that Baby was actually the one that programmed Myuu, and not the other way around. Myuu later teams up with Dr. Gero in hell and creates Hell Fighter 17, which kills him soon after being activated. The above description came from Matt Wilkerson, and was edited by yours truly (contact me).